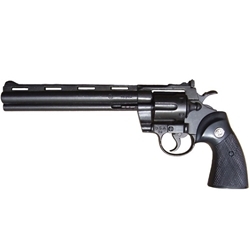 Our 357 Magnum Revolver with 8 in Barrel is a Classic (Dirty Harry) model high powered magnum. Features include an 8" barrel, swing out six shot cylinder and working double action. The .357 Magnum is a revolver cartridge created by Elmer Keith, Phillip Sharpe, Winchester, and the firearms manufacturer Smith and Wesson, based upon Smith and Wesson's earlier .38 Special cartridge. The .357 Magnum was developed over a period of time in the early to mid-1930s in a direct response to Colt's .38 Super Automatic. At the time, the .38 Super was the only pistol cartridge capable of defeating automobile cover and the early body armor that was just beginning to emerge in the post World War I "Gangster Era". The .357 Magnum is a replica of the original and does not fire live ammunition.